A simple case for the Raspberry Pi camera module. It does look a little nicer than the naked PCB and it will protect the sensitive circuit from you. If you can't touch it you can't short (or ESD) it with your fingers. Since there are two official and many third party camera modules out there, I prepared a version for each type I already had my hands on. Where meaningful, I created a front and a back cover. The two official camera versions have most or all of their components on the backside. 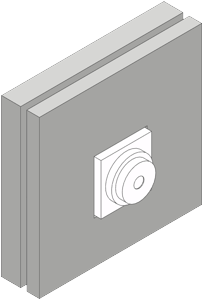 Therefore if circuit protection is your main concern you should print the back cover. Of course you can use both too. While designing my parts I always try to optimize their design and orientation in a way that won't need support structures while 3d printing them. Of course you can rotate the parts around the Z-axis prior to printing, but please don't do so on the X/Y-axis. A layer height of 0.3mm is optimal. Because of the small size I print them all at 100% infill. A 3D printer to print the .stl files on this page. 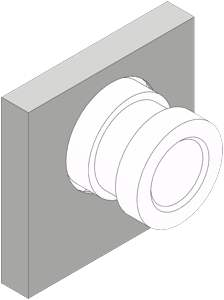 One (preferable two) screws of ø2mm and about 8mm length. If you want to combine this with for example a M12 mount or M12 mount with IR cut filter or any of my Alignment accessories, you may need longer bold and nuts or screws for that! The official v1 5MP camera module. See Official v1 5MP camera module for more details about the camera module. The official v2 8MP camera module. See Official v2 8MP camera module for more details about the camera module. A third party 5MP camera module. See third party 5MP camera module for more details about the camera module. A third party 5MP camera module with factory installed M12 mount and lens. See third party 5MP camera module with factory installed M12 mount and lens for more details about the camera module. There is only a front cover because only the front side has components on it.